We are excited to share with you our collaborations for New York Fashion Week Autumn/Winter 2019, kicking off with 11 Honore. 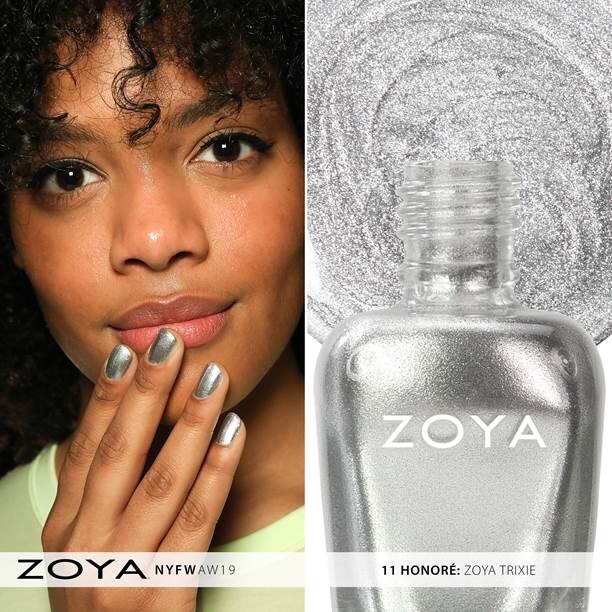 We were thrilled and very proud to partner with 11 Honore this season as we felt it was a natural fit for the Zoya brand. Additional images are below the show look details. 11 Honore’ is a size-inclusive shopping site that for the first time ever, gives more women the option to experience the best designer clothing and celebrate and honor their bodies, beauty and style. Using Trixie for the nails and toes, we wanted to bring this idea of a new fashion era of inclusivity to life. The pieces shown in the collection may have been created by different designers, but the nails tied them together. The 11 Honore show included bright colors and fun prints from participating designers. Embracing ones individuality through fashion and self-expression was at the forefront of the show. From the playful fabrics to the silhouettes, the pieces embodied inclusivity for all women of varying sizes and shapes. To celebrate this new era of fashion that promotes beauty and strength, ZOYA in Trixie was used on the nails and on a select number of models toes. Begin by cleaning and prepping the nail with ZOYA Remove Plus. Start with Naked Manicure Naked Base to provide a nice base for the polish. Apply two coats of ZOYA in Trixie. Follow with a coat of ZOYA Naked Manicure Glossy Seal to give the nails that perfect, high shine finish. For a quick dry, add a few drops of ZOYA Fast Drops. Repeat the steps for the toes. The show was absolutely stunning, and actress Laverne Cox closed the runway on a strong and empowering note.